Friday words! Here's an interesting milestone: this will be the last words post I make while I'm still in my 50s. Note #1! This week's new word features politics and (especially) strong language. Note #2! The discussion might also be a little too inside-baseball; it's a word about words. Sorry about that. So. This week's new-to-me word is also actually new: shitgibbon compound. Of late, many people have been discussing the insult shitgibbon. The word rose to prominence during a series of tweets that were posted when then-candidate Trump visited Scotland and made some statements that people disagreed with (example); it then came up again when a US legislator used it in an angry tweet. If you're interested in the rise and spread of this term, the linguist Ben Zimmer traces it in an entry on the Strong Language blog. Something I like about the term shitgibbon compound is that the name is based on an exemplar of the genre. The linguist Brianne Hughes did this also when she named cutthroat compounds—words based on verb+noun like pickpocket, tattletale, killjoy, and of course cutthroat itself. Anyway, now when someone calls you a fuckweasel, you can enjoy knowing that you've been insulted using a shitgibbon compound. 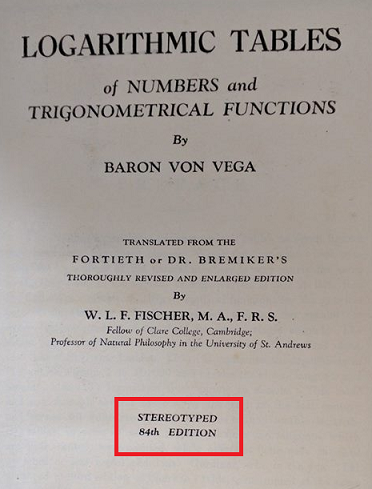 This was initially a remember-when post about the days before calculators, but a lively side discussion emerged about the term stereotyped on the book's title page. I'm sure we all know the meaning of stereotype as "a preconceived notion, especially about a group of people." But that doesn't make sense for the use of stereotyped on the book's title page. It turns out that stereotype started life in the printing industry in the early 1700s. 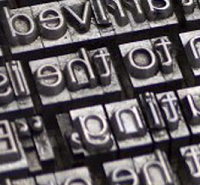 In those days, back when type was set by hand, it was tedious and expensive to re-set a book if you wanted to do a second printing. So if a savvy printer thought they might need to reprint a book, they'd set the type for a page and then make a mold of the typeset page—a kind of snapshot of the full typeset page. (The mold is known as a flong.) The printer could then cast a new page, complete, from the mold, and print new pages from that. The plate that was cast from the mold was known as a stereotype, from classical roots meaning "solid" + "type." The metaphoric use of stereotype derived from this quite concrete sense, picking up on the sense of making a copy easily. Fun fact! Another word for stereotype in the printing sense is cliché, from French (obviously?). This comes from a verb clicher, which means to make a stereotype in this way, and apparently is onomatopoeic, from the sound that the mold makes when you lift it off the type. You can see pictures of all this on the Wikipedia article about stereotype.